We hiked to Twin Falls, which are two beautiful waterfalls inside the Twin Falls National Park. We had two new hikers with us, Benjamin and Jennifer Thompson, my husband and sister-in-law. It was great having them on this adventure. Benjamin and I have been married for 12 years. We practically think alike. So when it came to getting up and over big rocks, the movement was much more intuitive. Jennifer had never gone on a hike with me. She has helped me up and down stairs at her house and watched Ben carry me up and down lighthouses, and other crazy places, but this was a first. I am so glad she came and had an opportunity to jump in the ice cold mountain water! As I was editing this video, I had a particular feeling that 'Yes! We're doing it!' I think because we had a larger group this time and everyone was taking turns and working together. Secondly, almost everyone, including Sophia and Tychon, jumped in the water! The looks on everyone's faces when they emerged was so pure! There is something about choosing to jump into ice cold glacial water that can make a person feel truly alive! You feel stronger, invigorated, rejuvenated, and brave! We chose to challenge ourselves and we lived! For a lot of people that would be too much for them. It would invoke too much fear and the thought of jumping into dark natural waters would be alarming. The beauty is... that's the point! It's the first step towards awakening to your true authentic nature! Personal Challenge awakens your personal power and your perspective about yourself begins to shift. When this happens, you start looking at the world differently. The world is a less scary place, and you can connect with it more and more. So beautiful! I didn't show any of the hike down because it felt so natural to end at the waterfall. Plus, the video was getting long. It was my goal to make this video significantly shorter from the first. I accomplished that only by leaving out half the video. HA! Lastly, after this video, I went home to Idaho and had my Freewheel worked on by Pat Doherty, the man who makes the Freewheel. He gave me practically a new Freewheel and sponsored the whole endeavor. I am very excited about the next hike! It's going to be great hiking with a properly fit Freewheel. We won't have problems with it falling off anymore. Big thanks to the Daly, Preston, and Thompson's for being my Team SUMMIT for this hike! What a great time! If you would like to take part in the next Summit, please contact us at info@laceyheward.com. WHAT'S YOUR SUMMIT? Rattlesnake Ledge! Editing this video brought me right back to the day we did this and it reinvigorated me all over again. It got me fired up and inspired to keep going and made me want to hike more with my family! It was so fun! It was also extremely challenging. The video is long! 15 minutes! And yet, I edited out so much of it! Still, I wanted to capture the emotion and the challenge of the climb. How every foot fall, and sometimes foot munch was vital to the whole thing. The vital parts I edited out will become out-take vids in another post. One video is us talking about this climb, and another is about how much of a hinderance my wheelchair was. Ironic, eh? We decided collectively after the second climb (next video) that it would be ideal to have a custom hiking chair made. There are already sick alternative mountain bikes made, but you can't take mountain bikes on walking/hiking trails. This would need to be more walking equivalent specific. Or that's the hope anyway. What that means is we are looking for teammates! This could be corporate sponsors or talented individuals who see the vision and want to take part in building and/or sharing in the vision by helping us build or get a chair built. We would love to hear from anyone wanting to create a relationship with us through email at info@laceyheward.com. I can also be reached personally at laceyheward@gmail.com. I learned so much editing this video. Since What's Your SUMMIT is all about the process, I thought about sharing some of the challenges I faced in making it in a few 'How To' vids, but I wasn't sure if anyone would be interested. If you would be, please leave a comment asking for them. Thank you for being in-tune within. Little Rippers means big FUN! Years of building up and breaking down my body, sacrifice, pushing myself to the brink of collapse both physically and mentally, and quieting my exuberant soul until I’m as focused as a hawk… passing this knowledge and experience on to others makes it all worth it. 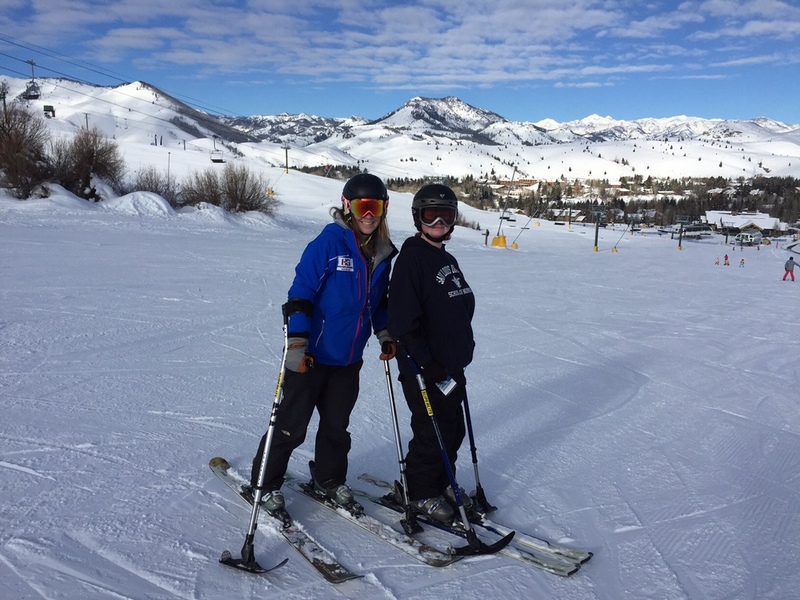 January 7-10, 2016, I had the opportunity to coach 5 eager athletes in a Youth Paralympic Race Camp, with the support of Higher Ground Sun Valley. These athletes had all the energy and fire to truly go for their dreams. They were ready. I had 3 days to convey to these young athletes, ages 9 to 16, everything that ski racing encompassed and the additional life skills I wanted them to take home, so that no matter whether they continued in their pursuit to ski race or not, they would have the confidence to keep moving forward. This was a lot of pressure I was inflicting on myself, but these athletes were important to me. They were like me and they were my mirror. If there was one thing I could impress upon them, it would be that they were enough for all their dreams! Watch and listen. Then watch and listen. Only then show and tell. I decided to cram everything I knew about being an athlete and a ski racer, into 3 major parts: BALANCE, FLEXIBILITY, and PRACTICE. The next three days flew by, and in the end, did I really get every pointed I wanted to make across to these brilliant little rippers? No. Probably not. But the most important element of skiing was accomplished… TO HAVE FUN!!! In the end, that’s really all that matters anyway. That’s why I started ski racing in the first place, and it’s the same reason I ski today! Because there is no other thrill like it! For all of you who’d like to nerd out on my curriculum, here it is! 3 days of undeniable passion for this awesome sport! Zach Miller (bright orange helmet) US Paralympic snowboard team hopeful. Tim Ball (Blue HG coat) instructor to Zach, Alaina ONeill not shown but her board is, and myself. Physical Balance: Strong core! Able to recover quickly in challenging circumstances. You mix up your workouts and cross train to keep good physical condition. Mental Balance: Strong Thoughts! No matter what disappointments or successes come your way, you know who you are and are able to stay focused on your goal. Heart or Emotional Balance: Strong Heart and Will! You have the determination to keep going for what you love and want. You are able to balance your athleticism with other aspects of yourself and those you care about. Doing some balance training in the gym with medicine and bosu balls. Flexibility is the ability to move in any given moment with one’s surroundings or situations. It is the ability to see ahead what’s coming, and problem-solve for the onset. Physical Flexibility: Quick action! You see something coming and you are able to quickly adjust your body to respond to the situation. Mental Flexibility: Open to new ideas! No matter how situations shift, change or stay the same, you can think outside the box in order to find helpful solutions. Emotional/Heart Flexibility: Intuition! You know yourself better than any coach, teacher, or master. You are able to adapt the notions of outside forces to your own needs and abilities. Makaiah Danzer (black coat) with Lilly Davies instructing (blue coat). Makaiah was very fearful of moving forward down the steeper part of the hill, but eventually trusted herself to make the turns. She did awesome! Every master has practiced their craft for 10,000 plus hours, to their entire life. Practice is putting balance and flexibility into action on a regular basis. WHY? So that in any given situation, you can have total confidence in yourself that you can quickly recover, make decisions and solve problems for ULTIMATE FUN! The crew heads to Elkhorn lift off Dollar, for some pow turns. When you can ski without thinking too much about it, your are totally FREE! And you know you can do anything and go just about anywhere and do what you love to do! Practice requires dedication, a bit of obsession and desire to have TONS OF FUN! The ultimate question is, do you have what it takes? The ultimate goal of race camp may not be to race. But racing forces you to become a confident skier. Balance and Flexibility are both required to do practice, and practice makes your balance and flexibility stronger. This day is dedicated to putting into practice what has already been learned. Tap on photo below to see more photos. Higher Ground Sun Valley including Mose Duchano, Cara Bennett, Alaina ONeil, Lilly Davies, Kelly Boudwin, Tim Ball, Bruce Rogers, Erin Rheinschild, Rich Cardillo and Monty Heath. Thank you to guest coach, David Poole. Additional photos thanks to Nicole Williamson. Hotel and accommodations thanks to Sun Valley resort. Most important thanks to the great athletes I had the privilege to work with: Li Dunbar, Zach Miller, Jesse Keefe, Mikey Williamson, Makaiah Danzer and Ty Wiberg.